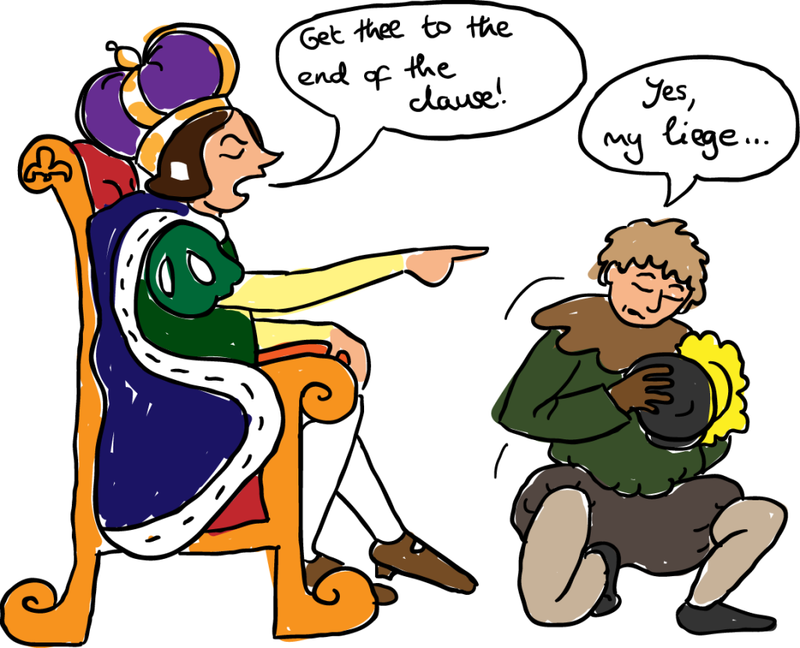 Guten Morgen Grammar: Conjunctions – Working for a noble clause (part 1) | Guten Morgen Berlin! June 22, 2015 - Guten Morgen Berlin! 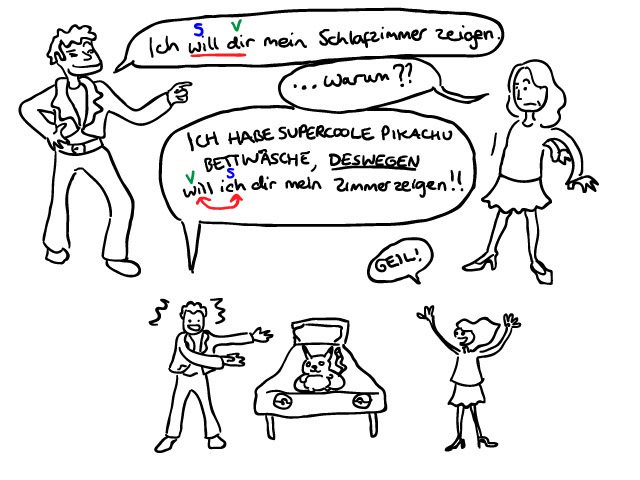 German conjunctions come in three different types, like the difficulty levels in Guitar Hero: Easy, Medium, and Hard. Rather than calling them that, though, we tend to give them more grammatically funky names so that we are able to bore schoolkids in a more effective manner. Their real names are Coordinating Conjunctions, Subordinating Conjunctions, and…well, I’m not sure about the third type and I’m not sure how to Google it either. I call them ‘Mixed Conjunctions’ because they have elements of both of the other types, but feel free to correct me if you know the official term. But trust me: beyond troublesome nomenclature, I do know what I’m talking about. First of all, let’s establish what a conjunction actually is. A conjunction is a little word which joins two clauses together, like sellotape or a staple. To give you some context, conjunctions in English are words like ‘and’, ‘but’, ‘however’ and so on. But (and you should never start a sentence with but) they are a little more complicated in German because different types work with the clauses in different ways. Ich treffe meine Freunde. Wir gehen zum Konzert. Ich treffe meine Freunde und wir gehen zum Konzert. Er hat einen Hund. Seine Freundin hat Angst vor Hünden. Er hat einen Hund aber seine Freundin hat Angst vor Hünden. Ich schaue gerne ‘Futurama’. Ich lade die Folgen herunter. Ich schaue gerne ‘Futurama’ und lade die Folgen herunter. See how, in this case, because we had the same subject in both clauses, we could just leave it out in the second clause? It’s just the same as in English: ‘I go to my nan’s and look after her cats.’ It would sound a bit clunky to say ‘I go to my nan’s and I look after her cats’ so we just take out the ‘I’ the second time around, but the rest of that clause stays exactly the same. 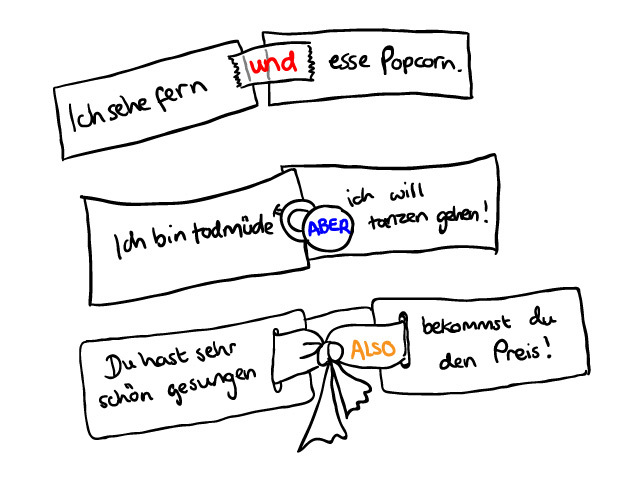 In German we can also leave out the verb the second time around if it’s the same, too: ‘Ich habe Gitarre gespielt und am Lagerfeuer Marshmallows gebrannt.’ (rather than ‘Ich habe Gitarre gespielt und ich habe am Lagerfeuer Marshmallows gebrannt.’). Er kommt vorbei, um uns seine Zeichnungen zu zeigen. Er kommt vorbei, um uns seine Zeichnungen zu zeigen und mit uns zu essen. Mixed conjunctions are a bit more jazzy because they do slightly affect the word order in the joined-on clause, but only slightly. In fact, they tend to take the same role as things like time phrases in that they cause the subject and verb to swap around following them. So, the second clause starts with the conjunction, then the verb, and thirdly comes the subject. Er findet seine Matratze zu weich. Er schläft lieber auf der Couch. Er findet seine Matratze zu weich, also schläft er lieber auf der Couch. Wir besuchen meine Oma jede Woche. Sie ist immer sauer auf uns. Wir besuchen meine Oma jede Woche, jedoch ist sie immer sauer auf uns. See how each time the verb comes straight after the conjunction, because these conjunctions grammatically take first position in the clause? I take your point, however the situation is complicated. I take your point; the situation is, however, complicated. Ich verstehe Ihre Meinung, jedoch ist die Situation kompliziert. Ich verstehe Ihre Meinung; die Situation ist jedoch kompliziert. A good rule of thumb is to use them in the same way you would use a time phrase: usually happiest when nestling comfortably in first position at the start of the sentence, but also won’t kick up a fuss in most other places in the sentence if you need it there for emphasis. This is very much an issue of Sprachgefühl, that gut feeling you get for using a language. I advise you stick to the tried-and-tested rules until you start developing your sixth sense in this respect. nichtsdestoweniger – yes, that is a real word. Means nevertheless. The third type of conjunction, the subordinating conjunction, is so stimulating and juicy that we can’t possibly sum it up without making this lesson WAY too long. So tune in next time for Part 2!